A local spot for fresh, organic nourishment that first opened last year in La Jolla and has another branch heading into North County's One Paseo development, Parakeet Cafe will soon expand to San Diego's Little Italy neighborhood, opening a 3,000 square-foot health-focused restaurant. Parakeet has been a cozy destination for friends and neighbors since launching in La Jolla last year. 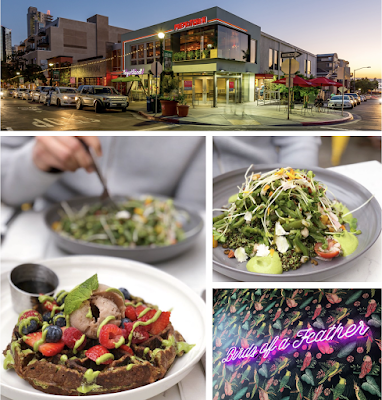 Founded by husband-and-wife Jonathan Goldwasser and Carol Roizen, who are also the owners of the San Diego-based Juice Crafters locations, Parakeet Cafe is centered around a menu of handcrafted coffee drinks and healthy meals made with fresh, locally-sourced ingredients. Parakeet Cafe is also opening a branch within the ambitious One Paseo mixed-use development. Both the Little Italy and One Paseo outposts hope to open by year's end. Parakeet Cafe Little Italy will sit at 1680 India Street below Prep Kitchen and nextdoor to Salt & Straw. The 3,000 square-foot restaurant will offer indoor and outdoor seating, as well as a menu of beer and wine to compliment it's Mexico-inspired healthy eats. For more information, visit parakeetcafe.com.